We know Seattle isn’t known for dancing audiences at shows. Usually, we all sway ever so slightly to the music being played on stage, which sort of freaks out some out of state musicians. But there are some shows where you just know standing still isn’t an option. For those of you ready to dance, tonight’s recommended show is for you! With deceivingly happy-go-lucky-sounding lyrics (have you really listened to Pumped Up Kicks? ), dancey keyboards and singalong choruses, Foster the People create hooks that make their music nearly impossible to get out of your head. As fun and poppy as their music is, the LA-based group focuses on very dark subject matter. They’re like Peter Bjorn and John’s younger, troubled kid brother. 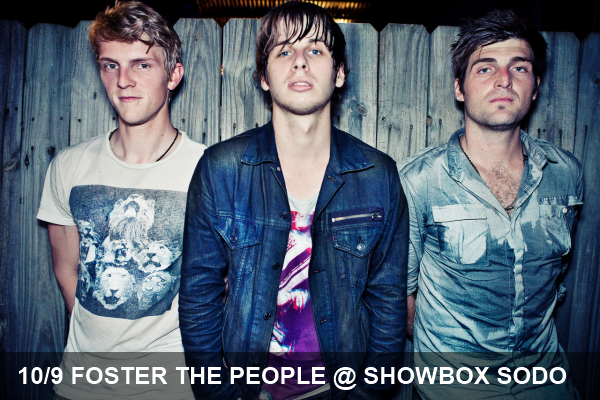 But dark or not, the show is sure to get everyone at Showbox SoDo moving, especially with Cults and Reptar opening.